Brined or dried, capers are valued for the burst of flavor they give to dishes, a flavor described as lemony, olivey, and definitely salty. They add texture and tanginess to a great variety of recipes, including fish dishes, pastas, and sauces. Because of their strong taste, however, they can't just be thrown in by the handfuls into dishes willy nilly. A cook needs to take care when including capers in a recipe, making sure the capers will not overwhelm the flavors of the finished dish. Capers are the unripened flower buds of Capparis spinosa or Capparis inermis. These prickly perennial plants are native to the Mediterranean and some parts of Asia and their use dates back to 2000 B.C. where they are mentioned as a food in the Sumerian epic of Gilgamesh. To turn these unripened buds into the salty green pea-sized balls, they are dried in the sun and then pickled in vinegar, brine, wine, or salt. The curing brings out their tangy lemon-like flavor, which is similar to green olives. The size of the buds ranges from tiny (about the size of a baby petite green pea) to the size of a small olive. The smallest variety from the South of France, called nonpareil, is the most prized and comes with an equally notable price tag. You will also find surfines capers, which are a little bigger. Larger capers are stronger in flavor and more acidic, so it is best to chop them up before adding them to recipes. Since the caper buds are picked by hand, the cost of a small jar can seem excessive. Pickled nasturtium seeds are a handy substitute. You could also try making your own poor man's capers at home. It's important to note that capers are not the same as caper berries, which are the fruit—not the flower buds—of the caper bush. They are larger than the biggest caper, about the size of an olive, and attached to a long, cherry-like stem. Caper berries have very small seeds inside that are similar to kiwi seeds. When pickled, they make an interesting garnish for bloody mary cocktails and martinis. Capers have long been a favorite in the Mediterranean region, possibly best known for being a star ingredient in the Italian recipes chicken piccata and pasta puttanesca. The French add them to skate Meunier with browned butter. In India, the fruits and buds of the plant are pickled. But these small, green buds can lend a piquant sour and salty flavor to so many other recipes, including salads, dressings, sauces, roasted vegetables, and a variety of main dishes. The vinegary burst of salt is a great complement to fish, especially rich ones such as salmon. Capers are also a staple when it comes to a New York-style bagel with nova lox and cream cheese. Many recipes call for rinsing the capers to remove some of the vinegar, which allows the true flavor of the caper to come through. 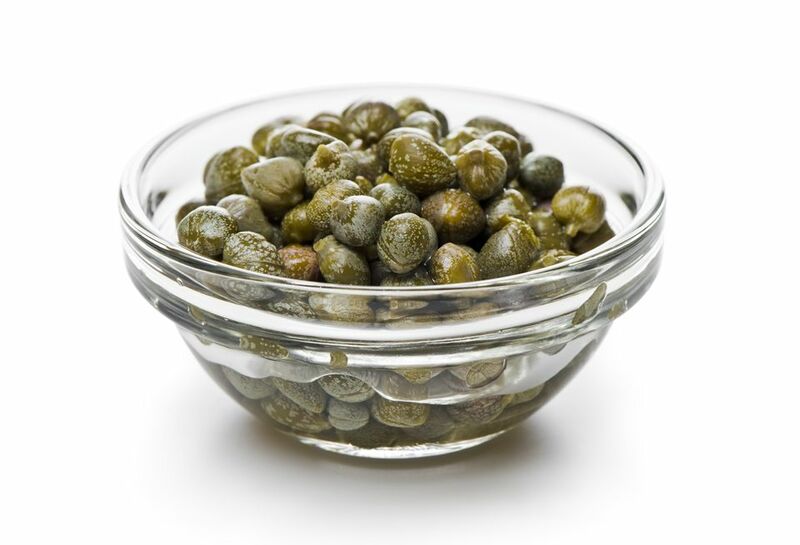 You will also notice that capers are typically added to the dish toward the end of the cooking process, which allows the capers to keep their shape and maintain their signature taste. Quite often, you'll find capers partnered with lemon, which complements their natural lemon-olive flavor. Since fish is a natural pairing, try broiled tuna with lemon caper sauce or, for a real culinary adventure, the Italian vitello tonnato (veal in tuna-caper sauce). For a recipe without the extra lemon, grilled caper and dill salmon is one you won't want to miss. When you're serving a salad, mix up a tahini caper salad dressing and drizzle it on top of your greens. It's an easy recipe that has a nice zing; you'll find you want to use it on other dishes as well. Capers are also an essential ingredient for a number of Spanish tapas. For example, their tangy flavor pairs perfectly with goat cheese, paprika, garlic, and sun-dried tomatoes. When it's time for lunch, consider a recipe like a simple pasta with capers, olives, and pine nuts. For a fancy dinner, try your hand at a rack of lamb with herb-caper sauce. What Are Scallions or Green Onions? What is Miso and How Can You Use It? Wondering about Israeli Couscous or How to Cook It?